After 46 years abortion’s ultimate target is the family. Anthony and Jen have five kids—Michael, Isabel, Gianna, Keith, and Joseph, ranging in age from three to 11. Little Joseph, the youngest, has cerebral palsy. When he was born, Anthony began the push to get off night shifts as a cop. Raising a child with disabilities was getting hard on Jen. She never complained but knew things had to change. They’d been married 13 years. Now, years later, Anthony and Jen struggle. They have homework every night, a porch that needs power washing, a yard that needs cutting, and a child with disabilities. Anthony has a stressful job, and Jen stays home with five kids. 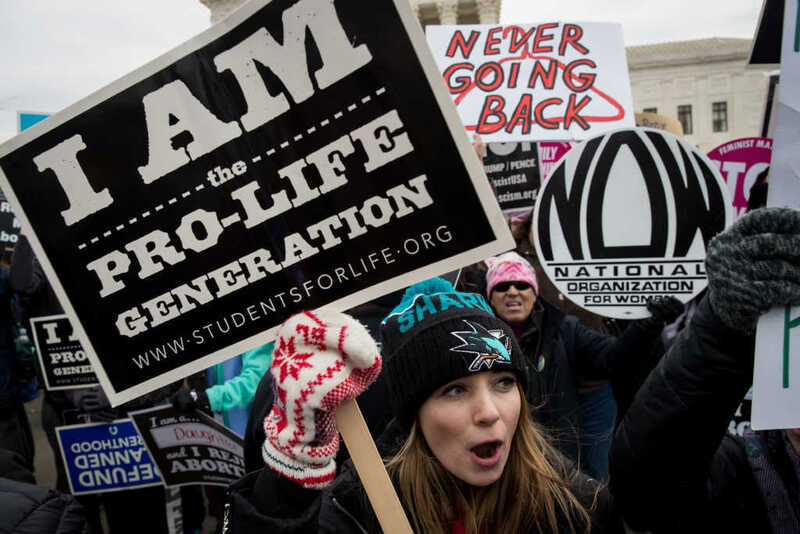 They go to church, pray, play with their kids, and—locked and loaded with strollers and snacks—make it out to their local 40 Days for Life campaign when they can. I’ve been to hundreds of abortion facilities. There is a glaring vacancy on the other side of the fence, the side where the abortion facility sits. The beauty that abortion directly attacks—a loving family—is nowhere to be found. There is nothing more unnatural than paying a physician to end the life of your child. There is nothing more natural than a married couple welcoming a baby into their home, and there is also nothing more exciting or rewarding. “A saint is one who struggles,” goes the timeless Christian saying. We are not promised, in this life, a perfect upbringing or healthy kids or a good night’s sleep. We are promised a struggle, and much of that struggle today, as we march, is for the family. Abortion is first and foremost an attack on the beauty of the family—for it to happen, there must be an unwanted child. The real heroes of our culture aren’t on television. They’re raising their children, listening to their children, laughing with their children, and suffering with their children. Anthony and Jen and those like them are the answer to the great attack on hope in our culture. Perhaps more than any culture in history, we view children as a burden. The joy of having children and raising them is being lost because of the lie that children are a burden, that they’re simply not worth it. This is the hopelessness that fills parking lots of abortion facilities. But it didn’t start there. It started in the home—or perhaps because of the lack of one. There are many ways to help end abortion, and we need to pray and get busy. But more than that, we need the Anthonys and Jens of the world. Yes, they struggle, but not everything has to be picture perfect. It’s okay to struggle. Abortion facilities are full of anxiety, fear, and loneliness. Compare that with the peace and serenity of a loving family. We need not be anxious about the crisis of abortion. Instead, we need to pray, trust, and march as we pass 46 years of legalization here in the United States. This—the family—is where we place our hope to end abortion. There are many basic and secular reasons to be against abortion. But the physical assault on the baby reflects the greater assault on the family, and therefore an assault on hope. Abortion represents and brings about a loss of hope. At the March for Life in Washington, D.C. a few years ago, I looked in the distance and saw Anthony, Jen, and their kids. I had first met the family at a 40 Days for Life vigil years before. I waved—they couldn’t see me, but there they were, holding signs, five different snacks spread among the kids, everyone bundled up in the January wind with little Joseph in a stroller with just his blue eyes showing. I don’t know whether Anthony had to go back to night shifts or if he ever power washed his back porch. But I do know he is a man who loves his wife and his kids. He doesn’t resent getting another medical bill for Joseph, and he’s overjoyed to dance with his girls in the kitchen on a school night. He prays with them. He and Jen have the usual family problems: boys showing an interest in their girls, college expenses coming, broken-down cars—and on top of that, they have future medical concerns for Joseph. In short, they have a life. But they pray, and they entrust their family to God. Their house is decent, though it needs some work—but their home is magnificent. It has the power to change the world. They are raising a family. They are marching for life in the cold, and they are not alone. They are the beginning of the end of abortion.